As mentioned, this issue closes out the first arc, and there are a lot of subplots that need to be dealt with here. When we began with issue #1, we got a team that was fully formed and Gail had the task of showing us the characters from that perspective. Over the previous seven issues, we’ve seen some internal dissension within the team, as well as their feelings and responsibilities toward each other, and what they all believe in. No one has been ignored at all and each member of the team has been given time to develop. So, where the first issue fave us a ready team, issue #8 gives us a team that finally has some experience and has gone through some serious adversity together as a single unit. In the previous two issues, Vengeance Moth has emerged as a strong character and the new issue marks her singular moment where she transcends from being a minor member of the team to something more. Being a disabled character, this is all the more important and it really brings her into the limelight. Mouse was my favourite character up until about issue #5, but Moth has quickly overtaken him in that department. There’s also Burden, who had some seriously good scenes in this issue and in #7, and I wish that we could see more of him. A possessed individual who shares his body with a rather ominously vengeful Pit Lord from Hell, Burden is another character who has really grown by leaps and bounds from where he was in the first issue. For both Moth and Burden, the series has been one about coming to terms with who they are, what they are, and celebrating that in their own way, taking things in stride and dealing with problems as they arise. But that’s not all however. The Movement represents the citizens of Coral City in standing up to the ills of their city, to combat it in terms that the corrupt leaders can understand. But there is always a flip side to that particular problem, and this is where the Coral City Police Department comes in. We saw Officers Yee and Whitt beings the first-instance cases of corruption in the city right at the start of the series but over time Yee has come around to the belief that he really can be the better man while Whitt has degenerated further and further. In the previous issue we saw the setup for a big fight between the two of them and in this issue we see it all play out. And we even see how a corrupt system can still be used to punish those same corrupt people, as happens with Whitt here in the end. I loved that angle, and it was nice to see that the Movement wasn’t directly involved in it. Finally, the only (somewhat) negative element of this issue in terms of the art was that the Graveyard Faction got dealt with in a somewhat perfunctory and matter-of-fact manner. There wasn’t the particularly exact resolution I was looking for with them, but that’s another case of how the characters of the Movement have matured over the previous issues. If corrupt people like Yee can do an about-turn, then the Movement can do too, even though they already start out by being the good guys. Its a matter of how far they can all go. Where the art is concerned, I was pleasantly surprised with this issue. Despite the heavy use of inks, something that bothered me about the series’ artwork from the start, Freddie Williams was on top-form here and his pencils were much cleaner than they’ve been before. And Chris Sotomayor’s colours were something else too this time around. They were much more upbeat and bright, reflecting perhaps the resolution of the issue itself, and that’s great. Overall, I’m quite happy with how the art turned out this time around, and I love that Freddie and Chris have largely stayed consistent throughout their run so far. As for the ending itself, in the next issue The Movement will finally have a crossover with a character that I’ve been wanting to see in this book for quite a while and I’m really excited about it. One hint: wheel-chair. That’s all that needs to be said I think. There are some great potentialities here with regards to how this character will interact with the team, particularly Moth, and I can’t wait to see it all. More The Movement: #1, #2-3, #4, #5, #6, #7. 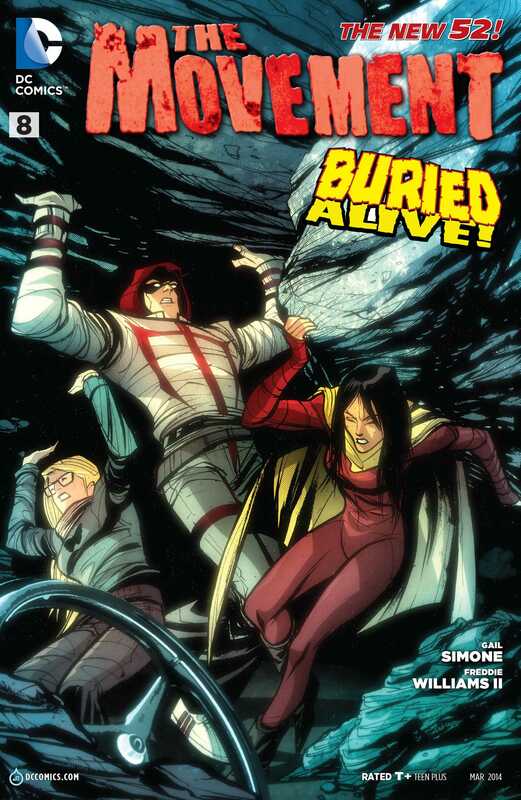 Posted on January 11, 2014, in Comics Reviews, Review Central and tagged Characters of Colours, Chris Sotomayor, Comics, Comics Review, DC Comics, Demons, Disabled characters, Female Characters, Freddie Williams II, Gail Simone, Humour, New 52, Review, Review Central, Superheroes, The Movement, Vengeance Moth, Vigilantism. Bookmark the permalink. 5 Comments.